Calculating the speed of a ship was not easy before the introduction of modern satellite equipment. The speed of a ship was calibrated in past times by using two sets of marker posts on nearby land whilst sailing on a set bearing at full speed. When the first two markers are aligned the start of the measured mile is recorded by noting the time on a stopwatch. When the second two markers are aligned, the end time is recorded. To make an accurate measurement the ship must make at least four to six runs over the course. The average of the runs is then calculated. From early times to quite recent all ships tested their engines using this method. 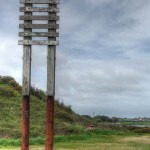 The start and finish of the measured mile was indicated using marker buoys. Most major ports had a measured mile nearby to aid ships in verifying and modifying their shaft R.P.M. (revolutions per minute) in relation to speed through the water. This was necessary because many Navy ships did not have any direct speed measuring devices and the navigator would often consider the estimation of speed by propellor shaft R.P.M. as an accurate measurement of ships speed. As the hull of the ship and its resistance would change over time because of planned alterations or fouling, navigators tried to schedule a measured mile run at least once a year to calibrate their speed measurement and prepare a graph of shaft R.P.M. versus speed. A ships speed is given in knots (and NOT knots per hour). A knot is one nautical mile per hour. It was first based upon the number of knots passing over the stern of a ship whilst a knotted line is played out. 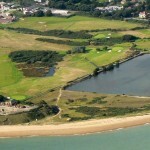 STOKES-BAY, a village in Alverstoke parish, Hants; on the coast at the terminus of a short branch of the Southwestern railway, 2 miles S of Gosport. 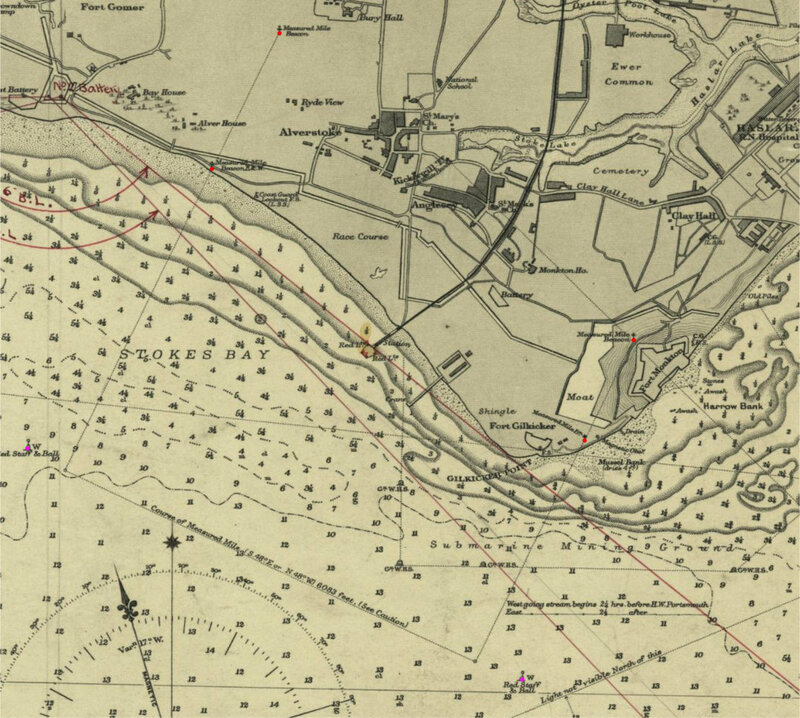 It has a relay station with telegraph and a coastguard station; is the point of steam-boat communication with Ryde; and overlooks a famous roadstead, where all ships of war, when fitted with new engines, test their speed at a measured mile. Notice is hereby given that two beacon buoys painted red with staff and ball have been moored of Stokes Bay, Spithead for the purpose of indicating the course of the measured mile for testing the speed of Her Majesty’s ships. The Eastern buoy lies in 10 fathoms water at half a mile southward of Gilkicker Point. 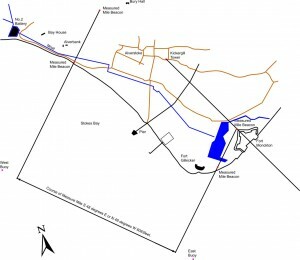 The Western buoy lies in 10 fathoms at three quarters of a mile southward of Brown Down batteries on the shore of Stokes Bay. These buoys lie in a N.W. and S.E. direction and are placed a cable’s length from either end of the measure mile. 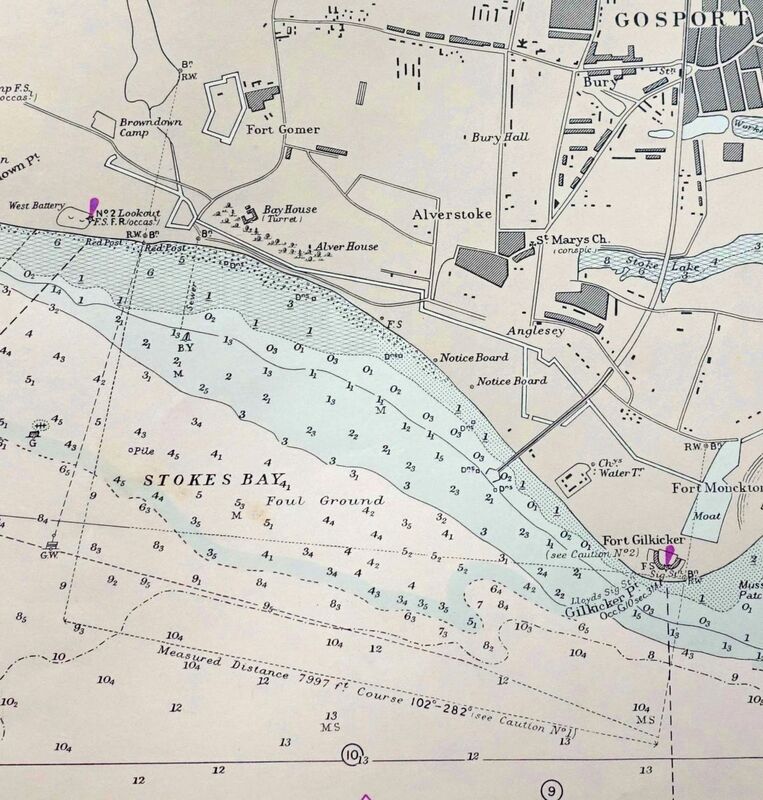 As the course between the buoys is not more than 1.5 cables outside a bank in Stokes bay, on which there are only 3 3/4 and 4 fathoms at low water springs, vessels of heavy draught should not turn inward or towards the shore of the Bay. 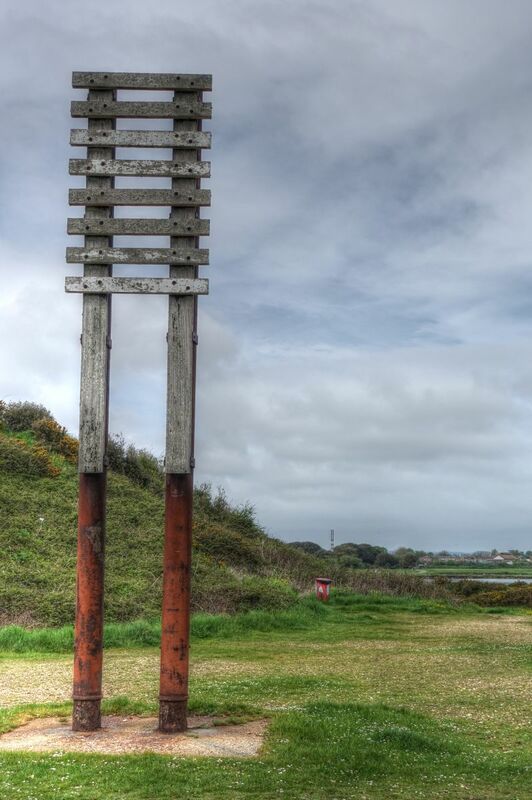 the buoys marking the measured mile in Stokes Bay are changed to white with a red staff and globe. 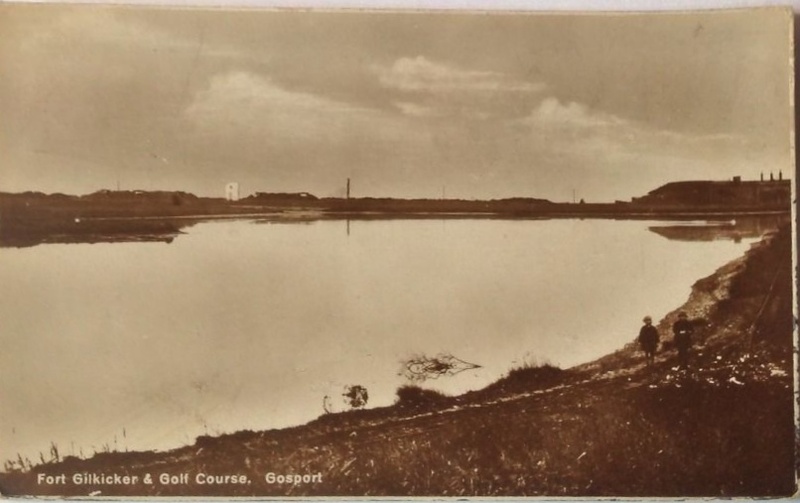 Several locations around the British Isles had sets of measure mile marker posts, one of them being Stokes Bay at Gosport. 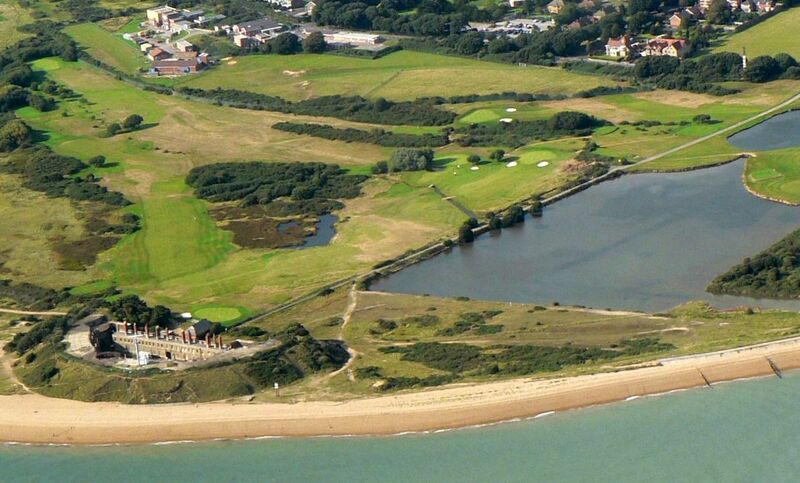 The first set of markers were situated at the eastern end of the Bay between forts Monckton and Gilkicker with the inner one at the central bastion of Fort Monckton. The western pair had one on the shore between Alverbank and Village Road with the inner one southwest of Bury Hall. 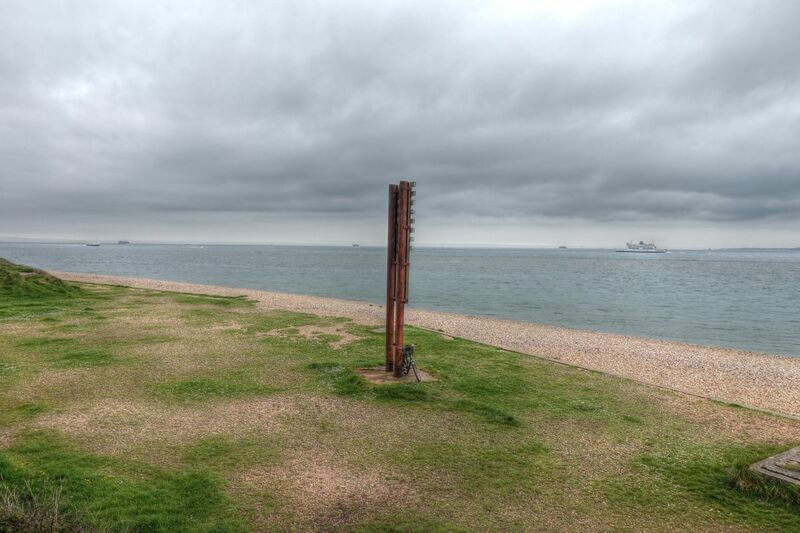 The Marker at Fort Monckton was used in conjunction with the Kickergill Tower as a means of safe passage for ships rounding the Warner Sands to find the deep water channel into Portsmouth Harbour. 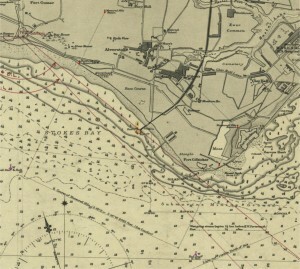 War Department chart dated 1898 showing the Measured Mile with the markers and buoys overlaid in colour. 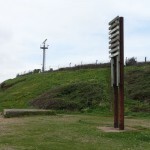 The measured mile markers were replaced sometime before World War Two with new ones situated at the Browndown end of the Bay (west) and at the Gilkicker end of the Bay (east). O.S. 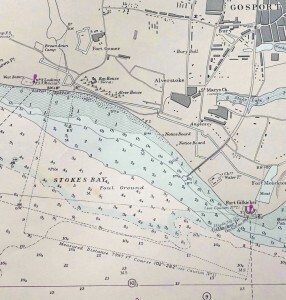 Maps indicate that they were in place by 1939 where they are shown as a ‘Landmark’. An aerial view over Gilkicker Point dated 1935 shows the old marker still in place. An aerial view of Gilkicker Point in 1935: The Measured Mile Marker can be seen on the shoreline between Fort Gilkicker and Fort Monckton. 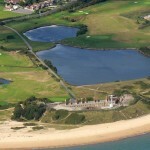 Nearby is a coastguard lookout. The top of Fort Gilkicker has been etched out on the negative for defence purposes. 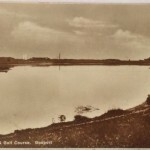 A view towards Fort Gilkicker across Gilkicker Lake. in the distance can be seen the measured mile marker and the coastguard lookout. The outer measured mile marker at Fort Gilkicker. 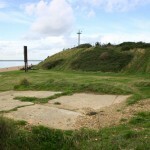 In the foreground is the concrete platform for a coast defence searchlight. The Gilkicker outer measured mile marker, photographed in May 2016. 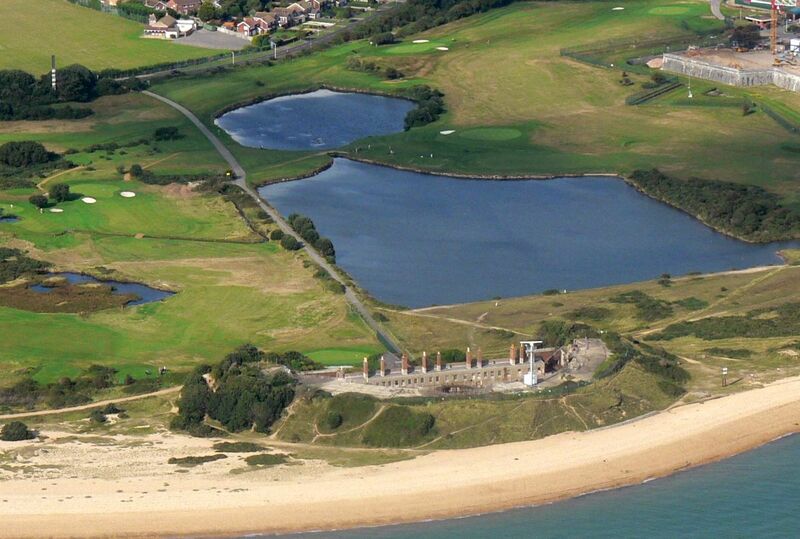 Beyond it is Fort Gilkicker with a concrete emplacement for a second coast defence searchlight below the earth bank. 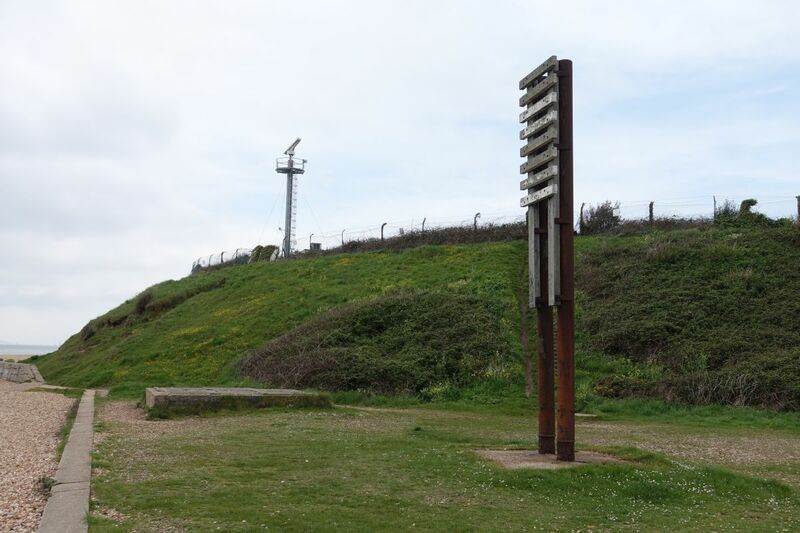 The later Stokes Bay markers consisted of two metal posts with horizontal slats, painted in sections alternately black and white, attached to wood columns bolted to the posts. The markers were set so that their alignment gave ships a course exactly one nautical mile apart. (A nautical mile is 6080 feet in length, as opposed to the land based statute mile which is 5280 feet in length), hence their name ‘Measured Mile Markers’. Looking out to sea. Beyond the marker you can just see the three Spithead Forts. The inner east measured mile marker. The only one to survive still at its full height. A view across Gilkicker Point with both measured mile markers. The outer measured mile marker with the inner one beyond in the distance. 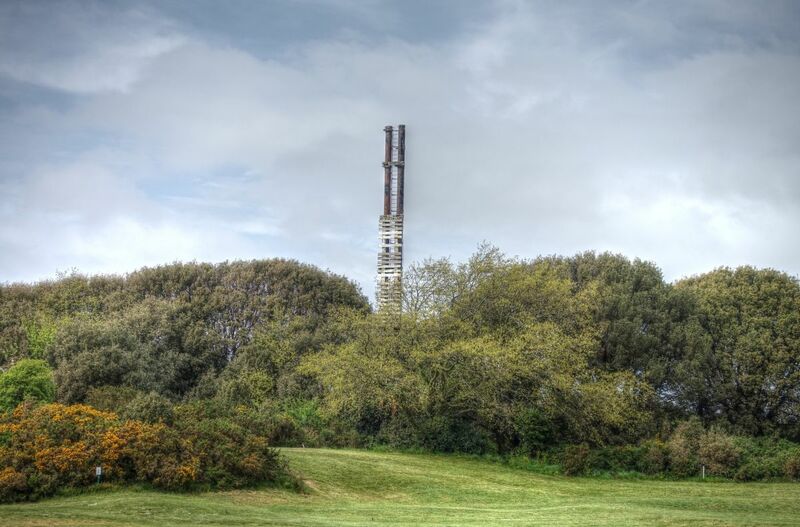 Although these markers are no longer used, the two markers at the Gilkicker end of the Bay can still be seen, one close to the east end of the fort on the shore, the other further inland close to the junction of William Jervois Way (the road to Fort Gilkicker) and Fort Road. 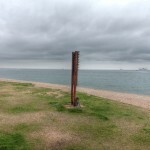 The outer seaward marker has been truncated. The inner one remains at its full height but the top sections of slats are missing. 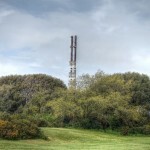 The two at the west end of the Bay have been completely removed, the inner one post 2001. 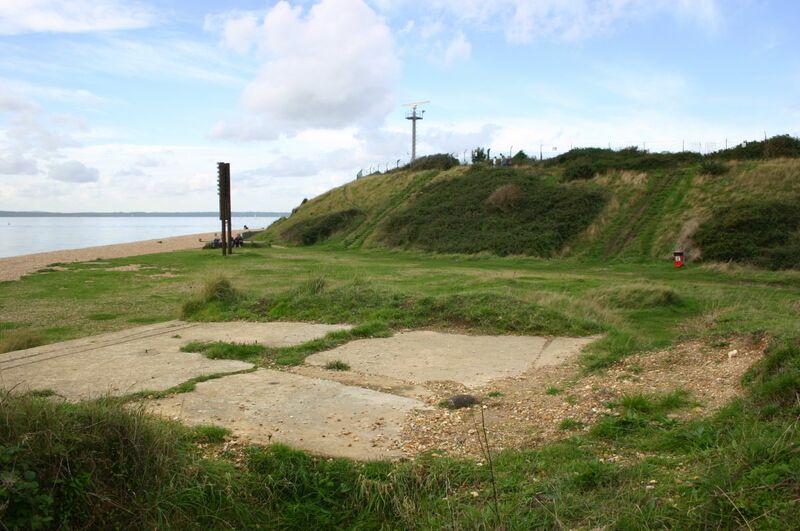 One stood just to the west of No.2 Battery, the other next to the Lee on the Solent railway line (later to become the main road to Lee). northwest of Fort Gomer and close to the River Alver at the junction of Grange Road and Privett Road.